Part of the continuing media response to her AP CS 2013 analysis, Barb was on HLN Weekend Express yesterday talking about the gender gap in AP CS. The video is linked below. My favorite part was where she told the national audience that Georgia Tech considers CS fundamental and requires it for everyone. 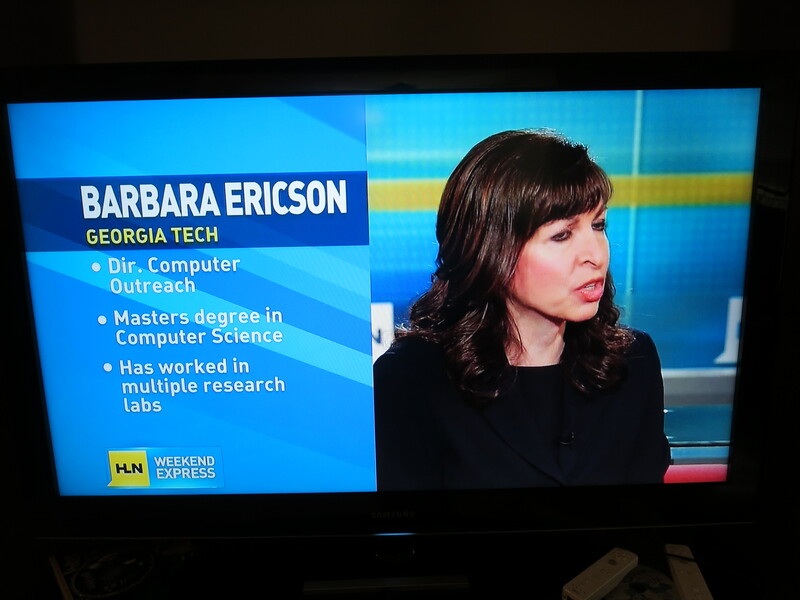 Barbara Ericson, director of computing outreach at Georgia Tech, has made a startling claim. She said not one female student in three states – Mississippi, Montana and Wyoming — took the Advanced Placement exam in computer science last year. Ericson appeared on Weekend Express to discuss the gender gap and explains why more women aren’t interested in computer science. via Why aren’t more girls interested in computer science? | HLNtv.com. The scope of the Chicago plan is impressive. In case you thought that the idea of offering foreign language credit for CS was a joke, it’s being considered as part of the Chicago plan. The rationale for the plan is interesting: Arguing that it’s about national competitiveness, and about democratization. On the first day of Computer Science Education Week, Mayor Rahm Emanuel and CEO Barbara Byrd Bennett announced the most comprehensive K-12 computer science education plan in a major school district. This plan includes creating a pipeline for foundational computer science skills in elementary schools, offering at least one computer science class at every high school, and elevating computer science to a core subject. In the next three years, every high school will offer a foundational “Exploring Computer Science” course. In the next five years, at least half of all high schools will also offer an AP Computer Science course. Chicago will also be the first US urban district to offer a K-8 computer science pathway, reaching one in four elementary schools in the next five years. Within five years, CPS will allow computer science to count as a graduation requirement (e.g. possibly as a math, science, or foreign language credit). Only thirteen other states have elevated computer science to a core subject instead of an elective. via City of Chicago :: Mayor Emanuel And CPS CEO Barbara Byrd-Bennett Announce Comprehensive K-12 Computer Science Program For CPS Students.